Yercaud is a hill station in Salem District, in Tamil Nadu, India. It is located in the Shevaroys range of hills in the Eastern Ghats. 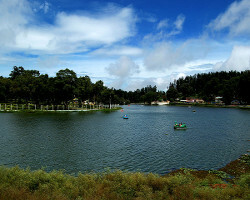 Yercaud is situated at an altitude of 1515 metres (4970 ft) above sea level. The highest point in Yercaud is the Servarayan temple, at 5,326 feet (1,623 m). 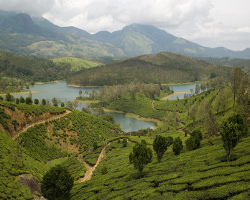 The name derives from 2 Tamil words - lake (Yeri) and forest (kaadu) because of the abundant forests near the lake. Coffee and citrus fruits, most notably oranges, are grown in abundance, as well as bananas, pears and jackfruit. Scenically, Yercaud is as enchanting and picturesque as the hill stations on the Eastern Ghats and trekking will be an experience. The National Orchidarium and Botanical Garden is situated in Yercaud. It is maintained by the southern circle of Botanical Survey of India. The National Orchidarium established in the year 1963.The place is also rich in endemic and charismatic species of wildlife including bison, sambar deer, spotted deer, anteater, jackals, hares, foxes, mongoose, civets, giant squirrels, and many reptiles including very rare ones. Yelagiri formally Known as Vellore Yelagiri is a hill station in Vellore district of Tamil Nadu, India, situated off the Vaniyambadi-Tirupattur road. It is surrounded by orchards, rose-gardens, and green valleys.It is located in between the towns of Vaniyambadi and Jolarpettai (Tamil Nadu, India). The hill station dates back to the British colonial days. Fr. Francis Guezou of Don Bosco worked for the uplift of hill tribals. He has been the main reason for the educational upliftment of the people of Yelagiri. Yelagiri Hills is further developing as a tourist destination by promoting adventure sports such as paragliding and rock climbing.The road to Yelagiri is well constructed and punctuated with the milestones and signboards. Petrol pumps are sufficient, making travel convenient and easy.It is ideal for the trekking activity. On the flora and fauna aspect, Yelagiri Hills is home to hundreds of snakes.